When I think of figs, I think of Teva-wearing hippies in Berkeley sitting in trees eating dried figs from the bulk bins of the co-op. And that’s cool. Real cool. I love the restaurants in Berkeley and the food co-ops are even better. Anyone else having a co-dependent relationship with the daily pizza menu at The Cheese Board Collective? No? Just me? Ok. Sometimes figs make me think of the ritzy San Francisco restaurants that serve them all alone on a plate and fawn over each fruit like it belongs to the royal family. But really, y’all, figs are a low-country Texas thing. They are not hifalutin like they have been made out to be recently. The Spanish brought the root stalks with them to Texas during their missionary efforts. Fig trees can be grown generally anywhere in the state with proper care. 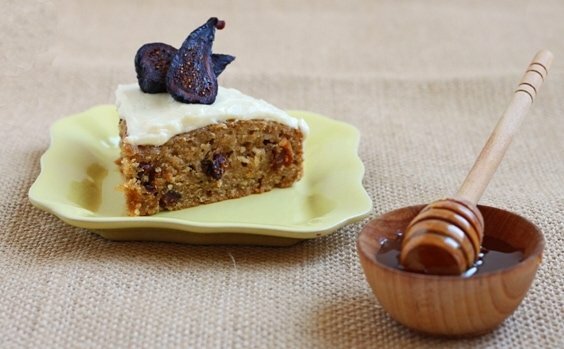 This cake uses whole dried Mission figs. Make sure they are moist and plump, not dry and leathery. You can use any variety of honey you like for the honey-laced cream cheese frosting. My favorites lately are orange blossom and buckwheat honey. Grease a 6-inch round cake pan with oil or shortening. Preheat the oven to 350 degrees. In a medium bowl, beat together with an electric mixer the butter, brown sugar and apple sauce. Add the canola oil, vanilla and orange zest and continue beating until very well combined. Add the egg and beat til combined. In a small bowl, stir together the flour, baking powder, salt, cinnamon and allspice. Add the chopped figs to this mixture and stir to coat them with flour. Pour half of this mixture over the wet ingredients and fold it in with a spatula. Add the remaining flour mixture and fold it in until well combined. Pour the batter into the cake pan and bake 24-28 minutes, until a skewer inserted the center comes clean, but do not overbake the cake or it will dry out. Let cool on a wire rack, then tip it out of the cake pan and let it cool completely. In a small bowl, beat together all frosting ingredients until smooth and creamy. Add more honey to taste, if you like. Frost the cake and garnish with extra dried figs. 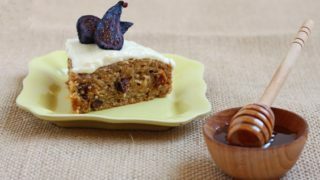 I’ve never had fig cake before but it is topped with cream cheese icing so it must be good! How could anything not be delicious with that frostong! Just the texture of this cake and the fact that it has figs in it has sold me. You did a great job on the frosting also. No doubt this is delicious. Thanks for sharing. I love this recipe, will be in my list of to do cakes. Thanks for sharing your recipe! I have been dying to try fresh figs and your cake looks heavenly! The only figs I’ve ever tried were in a Newton! Figs and I wear friendship bracelets. Oh this is gorgeous! Definitely need to get my hands on figs! I love that this makes a tiny 6 inch cake! Perfect for my little family of three! what a wonderful recipe… I love figs, this looks delicious I”ll try this for sure…. This cake looks delicious and so moist. Definitely want to make this soon! Oh, this is fabulous and I love figs! I’ll check back…because I’d love to know (since you tried the cake). How do you think this would be without cinnamon and allspice? I’m allergic to both and this cake recipe is FAB! I love figs!!! At home (aransas pass) one of our neighbors grows them in his backyard. Every year we buy a bucket of fresh figs for 8.00 dollars. I miss home!! bookmarking this for next year. thanks for sharing. happy tuesday!! OMG when i saw your post i was so excited – i thought I was as the only one who was in love with cheeseboard! I went to college in Berkeley, so naturally I am obsessed with Cheeseboard! I Love their creative twists on pizza. I even bought their cookbook ( their scones are delicious too!). SinceI got married and moved across the country i have had many cheeseboard withdrawals. Funny Story- the day before my wedding my friends bought me 1/2 a pizza from Cheeseboard and i ate the whole thing! Also your fig recipe looks wonderful I will have to try it for my parents! i can’t get enough of fresh figs!! your cake sounds so good!! This cake sounds just lovely :) they look so pretty and moist! thank you for sharing this. I have developed a love for figs this year, so this cake sounds and looks pretty awesome. Figs remind me of fall. I think it was because that is when my mom would start pulling them out to bake. Looks lovely! I love crunching on the seeds in figs, so fun and tasty. Fig cake sounds so unique and tasty! The only figs I ever get here are dried. But I’m thinking they would definitely get moist and delish in this cake!! ‘Figs” drew me into this post. I loved the info on how the fig is built up to be so royal. (I wasn’t aware they were indigenous to Texas. Apparently Texas does own everything…including figs!) Reminds me of how some pretentious restaurants make me laugh. Don’t get me wrong, I love to dine, really dine and appreciate truly good food well presented in a nice atmosphere. But when a waiter does an unbelievable sales pitch on an item on the menu and when served, you find yourself staring at it, like “this is what he was describing?”, you literally feel like you just ate his words. This cake sounds utterly satisfying and delicious! Thanks! I’m not sure how I feel about figs, but that frosting sounds amazing!! This sounds amazing, I adore figs! Honey and figs are the perfect pairing. I’m always so jealous of those people that have fig trees in their backyards, I would love my own fig tree! Thank you for your super-sweet comment on my blog, Christina! This cake looks scrumptious – yay for cream cheese frosting! Amazing recipe is a little different than the one we usually make at home but really delicious result. I shared it with all my friends, thanks for the recipe!